While Jack Dorsey’s Square has received much hype for its gadget which allows traders to accept card payments from their iOS devices, Sweden’s iZettle has been readying a similar solution across the Atlantic. Now it’s ready for an official launch. iZettle began a limited test service in Sweden in August. Now it’s announced that a full roll out will take place in its home country, with the startup mailing card reader devices to all registered users. 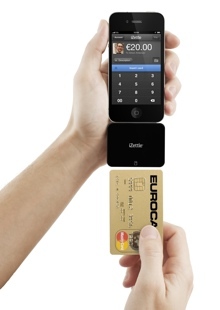 A wider European launch in “major markets” is planned to take place in early 2012.
iZettle differs to Square in that it uses the chip system popular in Europe for authorization of payments, whereas its US rival reads the magnetic strip on the rear of cards. iZettle is currently using chip-and-signature, which opens the possibility of chip-and-pin, which requires the cardholder to enter a four-digit code, being used in the future. This potentially makes iZettle’s solution more secure, although as this payment method isn’t available in the US that’s not a fair criticism of Square. iZettle, which announced an €8.2m ($11.2m) series A funding round last month, has no set-up costs and no fixed fees. The startup takes a 2.75% cut from each sale, plus a €0.16 ($0.25) transaction fee. Payments are then deposited into the seller’s bank account on the business day after the transaction. The iZettle iPad app will soon be updated to support multiple product sales in the same transaction, along with the ability to create custom menus of products for customers to choose from. Services like iZettle and Square enable traders who previously found card payments prohibitively expensive or impractical to accept them for the first time. Market stall holders, taxi drivers and tradespeople like plumbers are among those who could benefit and it’s potentially a huge market. Recent research cited by iZettle indicates that around 20 million European companies only accept cash, cheques or invoices. Indeed, the company says that in its test phase alone it has grown the Swedish point-of-sale market by 5%. If iZettle can move fast to get its solution established in major European countries before Square attempts an expansion to the continent, it could grab Europe’s mobile card payment market entirely for itself.